Beautiful, Lauragigs. I love you. I was dumfounded to hear the heartbreaking news. It’s extremely sad for such a gifted life to end so young. He was loved by so many, and will be remembered by many people. As I am grieving for his death, I am grateful that his life has touched mine. It will be a while before I can watch Brokeback Mountain again. Well Friends, I just finished watching Brokeback Mountain like I said I would. It was my way of honoring our man Heath tonight. Even though Heath may no longer be with us, his Ennis Del Mar will always be with us on DVD and film, Ennis Del Mar will always be with us! · 28 year olds aren't supposed to die, and I feel angry that it happens. I'm mad at fate or God or whatever it is that allows it. · Parents aren't supposed to bury their children. · Children shouldn't have to grow up without their fathers. · Mothers shouldn't have to explain to their children why their daddy ain't there anymore, shouldn't have to work to keep the father’s memory alive to them. · I hate that his sisters have lost their brother, that there's one less in their special, unique group now. · I hate what his friends and family are going to have to go through. After awhile, they will go on living their lives. Then, something will make them think of Heath, and, in a split second, they'll realize he's no longer here. It's like when the power goes off and you walk into a room and flick on the light switch but no light comes on. · I hate that those two ladies had to go through finding him like they did. That must have been horrible. · I hate that to some people, Heath's death is just a news story, whether they are reading/hearing/watching it or reporting it. · The cause of Heath’s death is all speculation right now, but I wonder if it was caused by an accidental, bad combination of meds, that they mixed together just wrong to stop his heart. I'm reminded of the night before my grandfather died, how he was miserable but the doctors wouldn't give him anything stronger than a Tylenol because his blood pressure was already dangerously low and stronger meds would lower it even more and kill him. · He will surely be remembered at the Oscars, and he'll get roaring applause. · The release of the next Batman movie later this year will be well publicized, and there's going to be this sadness attached to it all now. · I wanted to see how his career went as he aged, what roles he took, if he even stayed in acting. I was hoping see him when he got much older, like in his 60s and 70s, wondering what he was going to be like, how he'd look, what he'd be doing. · I hate that there will be no more movies with him, no more shots of him carrying Matilda on his shoulders, no more charmingly awkward interviews, no more celebrity sighting reports. · I know already that I'm going to buy every newspaper and magazine I can find that feature articles on Heath's life and death, even the trashy ones. I'll bet he gets the cover of People's next issue, probably the whole thing. · I hate that, like with Cass Elliot, errors and inaccuracies and speculations are probably going to be remembered and associated with Heath’s death. · I can be jaded and cynical, and I hate that one of the relatively few things that could get me excited like a kid is gone. · I hate that the sad, melancholy feeling that permeates “Brokeback Mountain” has increased exponentially and that it's based on reality, that it's not because of the death of a fictional character. As hard as Jack's death is to take, Heath’s seems harder for me because it's not just a movie. · I hate that we're never going to get to see corny reunions of Jake and Heath on awards shows. · I hate thinking about what was going through his mind as he died. · I hate this feeling that a good book I started reading or a wonderful movie I started watching just ended, got truncated, no warning, when it seemed like there was so much more to go, and I was so looking forward to it. · I hate that there's nothing I can do about this but get through it. Life will go on, and I'll feel better soon enough, but things aren't going to be quite the same. My Brokeback friends are a comfort and I appreciate you all, but nothing seems to really make me feel that much better. As cheesy as it may sound, Heath took a little bit of my heart and joy with him when he died, and I want them and him back. We each grieve in our own way. There is no wrong or right when it comes to grief. I don't think I will watch Brokeback Mountain anytime soon. I don't think I can bear it. Having said that, I'm very thankful it helped you Eric. I'm sure for some Brokies here seeing Ennis again will be therapeutic. I thought about watching it, but I just can't right now. Each one of us will work through this using different methods. And that is good, isn't it? Maybe someday I will watch it again. Hopefully soon. Damn, Laura. You made me cry again, but you made me smile too. It's beautiful. For me, Ennis Del Mar WAS Heath Ledger. After decades of unknowing, waiting, yearning, hoping…he appeared like a sunrise in my life. ‘It was just a movie and a character’ people would say; but, for me, much, much more…as you all know perfectly well in your own lives. Psychotic, perhaps. Immature, likely. But, I fell in love with this man, this character, this person who so led us out of a bog that was threatening, trapping, unfulfilling. He created a joy, a happiness, a welcoming that few, if any, had ever done. The sense of loss is complete; nothing can replace the man, the object of my reverence, or heal the wound now inflicted so unexpectedly. I know thousands feel as I do. Few had the chance to reach out to him and offer our love and compassion for all he meant to us. If only….if only someone could have been there to help him sleep, to ease his pain, to do anything in small reciprocation of all the good he did for so many. Guilt shrouds my being in large part. My spirituality tends to suggest that when a person’s “job” is done on earth, he is called to his eternal home. 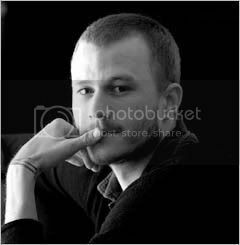 For me, dear Heath did more for humankind in 2 plus hours of film than many of us who strive and fail over the decades. He accomplished so much; but, why take the good so soon? When the forums began taking on new directions 12-15 months ago and discussions began to be heated debate on many social/political issues, the unpleasantness on occasion by myself and others seems so regrettable and a wrongly placed effort. He gave us joy. Two years ago, I felt happier than I have felt in 25 years. Today, the depth of sadness and pitiful wishing that time could be reversed just one day is overwhelming. He will forever be exactly what he was that created our legitimate obsession and passion. Now, he will never grow old; a love that will never grow old. Our Heath. The man who renewed my hope and my emotion. We’ve all talked for two years about his promise to Jake to never forget him; today that promise comes from my heart to him. Yes, we all have our own ways of dealing with this. For me, it was to watch the movie. That may not be for everyone now, and that is ok.
ya know i think its funny bout how many phonecalls i got today from people " did you hear"
I still can't wrap my mind around it. I still have a hard time to believe it. I can't say good-bye- not now, not yet.